Nature Saskatchewan is a non-profit charitable organization governed by a Board of Directors. Nature Saskatchewan has been dedicated to the conservation of Saskatchewan's natural environment since 1949. We promote appreciation and understanding of our natural world through conservation, education and research. Speaking for the protection and preservation of natural ecosystem and their biodiversity through research and viable conservation practices is our main focus. We strive to connect nature and culture through outreach programs and services. With over 600 members, Nature Saskatchewan provides programs and services that offer knowledge and experiences for those who have a love for nature. Our Vision: Humanity in Harmony with Nature. Our Mission: We engage and inspire people to appreciate, learn about and conserve Saskatchewan's natural environment. We are looking for passionate and experienced people to stand for election to our Board and to help direct the work of the organization. As a member of the Board, a Director acts in a position of trust and is responsible for contributing to the effective governance and administration of the organization. The Board of Directors endeavors to have balanced perspectives and a complementary mixture of knowledge, skills and experience. As a Nature Saskatchewan Board member you will gain experience working on the board of a non-profit organization. The candidate will have the opportunity to develop competencies that can aid career advancement and interpersonal relationships: teamwork, interactive communication, adaptability, planning and organizing, problem solving, creativity and innovation. Additionally, we very much welcome applications from both Indigenous peoples and newcomers to Canada. You have perspectives and experiences that would benefit our organization. Candidates with other applicable experience or strengths are encouraged to apply. Ideal candidates will have previous board experience in the not-for-profit sector, experience in sectors related to Nature Saskatchewan’s mission, and demonstrated commitment to leadership. Time commitment varies depending on your interests, circumstances, leadership roles, and/or special events. An average minimum time commitment of 5 hours per month is anticipated, which includes involvement in at least one Board committee. Board members are elected at the Annual General Meeting held each year in June and serve 2-year terms. Please email your completed NS Board Member Application Form by May 4th, 2019 to Donna at donna.bruce@sasktel.net. An accompanying resume would be welcome but is not required. Applications will be considered as positions on the Board become open. For any questions, please contact Donna at 306-956-3437 or by email. Nature Saskatchewan has some concern over a proposed Potash Mine southeast of Regina and north of Sedley. We are asking our members and supporters to email short letters to environmental.assessment@gov.sk.ca by April 15, 2019 (deadline comment period). A proposed mine site and drilling activity is planned for a large area which encompasses thousands of acres of native and tame grasslands, wetlands and riparian areas along Wascana Creek. There are large tracts of cultivated land in the area that should be used for development. Nature Saskatchewan is not opposed to the Can Pacific Albany Project potash mine but want to protect the highly fragmented natural areas from further impact. No construction and development on or near grasslands, wetlands and riparian areas along Wascana Creek. Development activities should not occur on natural landscapes but be moved to cultivated fields where the impact on the natural environment will be greatly reduced. Some 150 species of wildlife were documented during the environmental assessment. Species at Risk within the area include; Sprague's Pipit, Loggerhead Shrike, Ferruginous Hawk, Long-billed Curlew and Leopard Frog. We have already lost over 86% of our natural grassland ecosystem in southern Saskatchewan. Every effort should be made to avoid the further loss of these vanishing habitats. Be clear that you would like to ensure that no development will occur on any natural landscapes. We encourage you to use your own words in your email to the province. You do not need to mention all of these points. It would be useful to include a sentence or two on why the grassland landscape is important to you, that would be very useful. Your letter does not need to be long and detailed. What counts is the number of responses received by the province. Join the Yellowhead Flyway Birding Trail Association (YFBTA) on April 13, 2019 at the Saltcoats Community Hall for the 2019 Nature Event. “Ticks are my life.” said Dr. L. Robbin Lindsay, presenter at the upcoming YFBTA event at the Saltcoats Hall. Lindsay is a research scientist at the National Microbiology Laboratory in Brandon. He studies different kinds of ticks and how their populations have changed over time. “The deer (black-legged) tick is present now in places never seen before,” he continued. This tick, the one that causes Lyme Disease, has increased its range over the past decades. Despite that, the risk of Lyme disease in Saskatchewan is low. According to a recent article published in the Leader-Post, the province has collected 25,000 ticks since 2009. Only 65 were deer ticks and of that number only eight tested positive for the bacteria that cause Lyme Disease. The other types of tick found in the province include the dog tick, the Rocky Mountain wood tick and the winter tick. They are more a nuisance than a public health issue. Volunteers came up with the idea of a trail that would stretch across the country nearly twenty-five years ago. It was completed coast-to-coast in 2017. In recent years, there has been a change in names. TransCanada Trail is the national organization that works with local groups, provincial parks, First Nations and municipalities, the actual owners and operators of their particular sections of the trail. TCT does not own the land on which the trail is located. Rather, its role is to promote the use of The Great Trail and offer grants for maintenance, signage and trail enhancement. The venture was a partnership with the City of Yorkton. TCT granted $35,000 to the project while the City agreed to contribute an additional amount to a maximum of $65,000. At the Spring Event, Kristen Gabora will tell the story of The Great Trail, not everything as the title might suggest. After all, the trail is 24,000 kilometers long. Her presentation will provide information about the trail in general and nearby sections in particular. 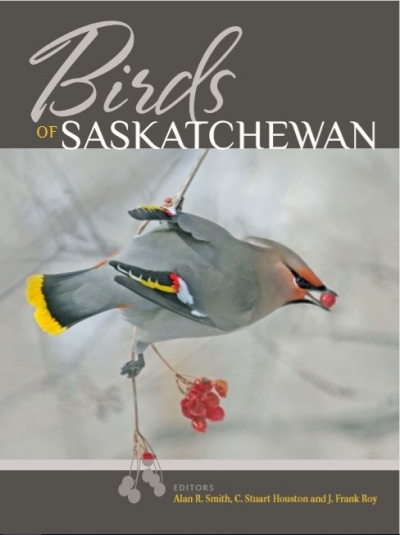 Birds of Saskatchewan tells you nearly everything you ever wanted to know about the birds of the province. This book describes the 437 bird species ever found here, advocates for stewardship of the environment and provides a benchmark against which these species can be assessed in the future. It is a collection of the best in Saskatchewan’s birding photography. But more than that, this ten-year project illustrates the commitment of those in the birding community. A bequest to Nature Saskatchewan from Manley Callin paid for the costs of layout, professional editing and printing Everything else was the work of volunteers. One hundred and seven volunteer writers compiled the available research and wrote the text. Birders submitted 6000 photographs. Frank Roy of Saskatoon headed up the committee who reduced that number to the more than one thousand used in the book. Alan R. Smith, Frank Roy and Stuart Houston were volunteer editors for the project. Houston is well-known in the area as a bird bander and writer. He began his study of birds as a boy in Yorkton. He and his wife Mary have banded more than 150,000 individual birds of 211 species. 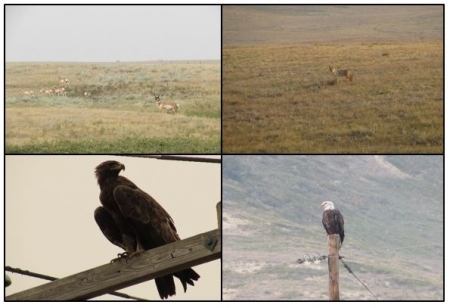 Bill Anaka, with his long-time friend Stuart Houston, compiled their birding observations and research into the well-respected Birds of Yorkton-Duck Mountain (2003). The information they collected was used as one fact source in this new publication. Though Anaka died in 2017, his work lives on in Birds of Saskatchewan. “This volume represents decades of observation and research,” said Joan Feather who will facilitate a Q and A about the book at the YFBTA event. After retiring from a career at the University of Saskatchewan in Community Health Research, Feather became active in the Saskatoon Nature Society and Nature Saskatchewan. She has served as president of the Saskatoon group and on the board of Nature Saskatchewan. year according to the FLAP Canada. at Beaver Creek when not otherwise in use. assessment of buildings for bird-friendly design during their review process. difference in community attitudes within such a short time span. Below you will find a letter to Catherine McKenna, Minister of Environment and Climate Change calling for an environmental assessment of agricultural drainage in Saskatchewan and the province's Agricultural Water Management Strategy. This letter contains an appendix highlighting the scientific facts of why this drainage is so bad for us, future generations, Indigenous peoples, our neighbors and the environment. Birds of Saskatchewan is now available for pre-order of the second print run. You can purchase your copy by phoning 306-780-9273 or 1-800-667-4668, via email at info@naturesask.ca or by visiting our online store. Citizen Science! You have likely heard of this term but do you know what it means and did you know that you can get involved? In short form, citizen science is the involvement of the public in scientific research. While citizen science can be applied in many areas of science it becomes particularly useful when tracking bird migrations, looking at species populations and monitoring changes. Once a year from February 15-18 people around the world count birds for at least 15 minutes as part of the Great Backyard Bird Count. By submitting data online, they contribute to valuable information about species health, population trends and more. Participating in the Great Backyard Bird Count is fun, simple, and anyone can participate. It is a great activity for families and groups or simply by observing birds through your kitchen window while enjoying your morning coffee. This ambitious five-year project teams citizen scientists with professionals to deliver a province-wide account of the distribution and relative abundance of populations of breeding birds. A collaborative effort between conservation organizations, government, the private-sector, and the public, the Atlas will provide an invaluable tool for wildlife conservation, education, and research in the province. This will be the last blog from the RPR crew this year. It's hard to believe that September is here. How quickly this summer has flown by. Although, with the weather being as variable as it can be in this province you can never count out the potential for a beach day regardless of what the calendar date says. We enjoyed the weather over the last few weeks and, although we always hope for rain in these dry years, we were also glad to not have been stormed out or encounter impassible roads this time around. In fact, we had a very successful field trip over the last couple of weeks searching for rare plant populations and monitoring past occurrences. 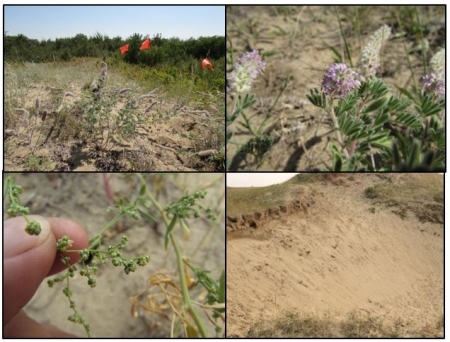 Thanks to some very useful habitat models we were able to find new locations of Smooth Goosefoot (bottom right), a threatened plant species that loves sand dunes, which was lucky for us because so do we. It’s always nice to get to explore the interesting dune habitat (bottom left) scattered across the province and I would recommend that if you haven’t been to the Great Sand Hills that you put it on your “must-see” list. We also found the Hairy Prairie Clover (top) populations that we were monitoring to be thriving, with several occurrences numbering in the thousands! This plant had been described to me as reminiscent of Sideshow Bob’s hair and after seeing it in person, I admit it is a great comparison. Along with finding additional target species such as Small Lupine, Bur Ragweed, and Beaked Annual Skeletonweed, we found some beautiful Scarlet Gaura (right) still in bloom, lots of broomweed and rabbitbrush, and many dotted blazing star (middle) and blue lettuce plants (left) in flower. We also saw some pretty cool insects such as Ten-lined June Beetles (right), whose large size, unusual appearance, and ability to hiss can be quite intimidating. As well, we were lucky enough to come across an adorable velvet ant (middle), whose plush appearance and misleading name are maybe not intimidating enough? Another common name for a velvet ant is “cow killer”. They are not actually ants but are wingless bees and although they do not actually kill cows, their name apparently stems from a reputation for having an extremely painful bite. I personally don’t care to find out what it feels like, though I must admit I am a little curious. Another neat find was a spider’s sand burrow (left). The tunnel was lined with silk and we were hoping to catch a glimpse of the brave engineer that lived inside but unfortunately weren’t so lucky. We are still waiting to hear about results of some funding applications and, therefore, we stayed at the lake with family for a few nights while in the field to try to stretch a buck. It was nice to be able to cool off at the end of the day by jumping into the water, and it didn’t hurt that beavers, herons, and these adorable little minks also call the lake home. We woke up to some beautiful views of fuchsia sunrises and mist on the water that our cameras just don’t do justice to. The latest encounters: male antelope watching over their harems, currently full of mothers and their twins; extremely well camouflaged coyotes; and Golden and Bald Eagles; were welcomed. This summer has gone by in a blur. I have truly loved spending more time in the field this year, and enjoy and appreciate all the animal and plant species that call this province home. A huge thank you to all the landowners who allowed us on their property, we couldn’t do any of this work without you!